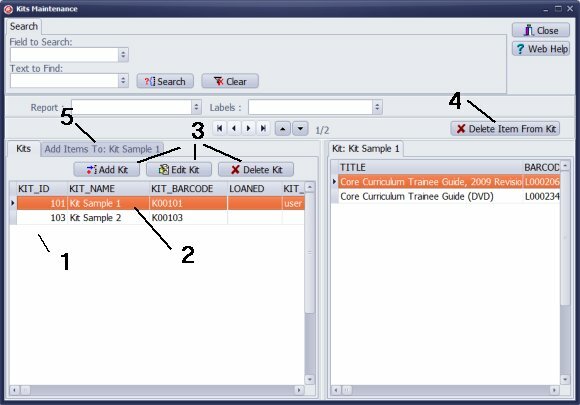 ﻿ Handy Library Manager, kit management window. Help, how to topics > Library Basket, Kit Building > Manage kits. The Kits Maintenance window opens with the complete list of all kits (1). The kits table includes: kit id, kit name, kit barcode, loan status, user fields. Click on any column header to change the display order. Click the column header, hold the mouse button down, move left or right to change the column order. There is always one kit selected (2), items for the selected kit are displayed in the Items In Kit section. Above the Kits table you have easy access to kit commands: Use Add Kit, Edit Kit, or Delete Kit (3). Above the Items In Kit section you have easy access to Delete Item From Kit command. Click on the Add Items To: Kit Name (5) tab to access add item to kit commands (barcode search, lookup search, add item). Compilation of questions and answers from library requests will help you to make purchase decision. How to verify if the item is checked out in the library main catalog window? Handy Library Self Check Out. How to create a new record using Copy Selected Item? How to modify library grid? Special Library, how to manage digital and paper document library? How to display library logo? How to display future reservations? What is the maximum number of library items? How to back up, restore, maintenance library feature? How to choose library labels? Library Inventory, detailed report sample? How to organize specialized library? How to set patron suspended status?